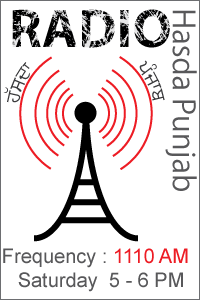 The Punjabi Association Hasda Punjab is a non profit organization formed by a dedicated group of volunteers with the primary purpose to serve the social, cultural and educational needs of the punjabi community in the Dallas Fort Worth (DFW) area. Our mission is to provide a common platform to all members living in DFW for pursuing their common goals while promoting social, cultural and educational activities of the members. The Punjabi Association Hasda Punjab is committed to serve the DFW Community with various Events and services. In the past few years it has organized various social, cultural and sports events. We welcome your feedback and strive to improve them on an ongoing basis.